National Parks in the Republic of Ireland and Areas of Outstanding Natural Beauty in Northern Ireland are some of the best places to see our wildlife showing off. They make some pretty playgrounds, too. Take Glenveagh National Park in County Donegal, with over 16,000 hectares of wilderness streaked with lakes, rivers and a castle. Falcons, ravens, peregrines and the recently reintroduced Golden Eagles take to the skies watched by you and the resident deer, badgers and foxes. County Antrim's Causeway Coast is another Area of Outstanding Natural Beauty with 18 miles of crumbling coastline, cliffs, and the Unesco World Heritage Site of the Giant's Causeway. The area is home to some charmingly named seabirds including guillemot, razorbill, kittiwake and fulmar – and if you keep your eyes peeled at the start of April around Rathlin Island, the puffins may come out to play, too. Life is also thriving around the shoreline with shrimp and crab, while rare plant species include the pretty Blue Spring Squill and White Sea Campion. Slip down the eastern coastline to Wexford Wildfowl Reserve's mudflats and islands, which house nearly half the world's population of Greenland white-fronted geese and over 190 species of waterfowl. Connecting all of these counties and more are the island's rivers and lakes, which are bouncing below the surface with perch, trout, pike, bream and salmon; while the banks rustle with mink, voles, duck and geese going about their daily business. 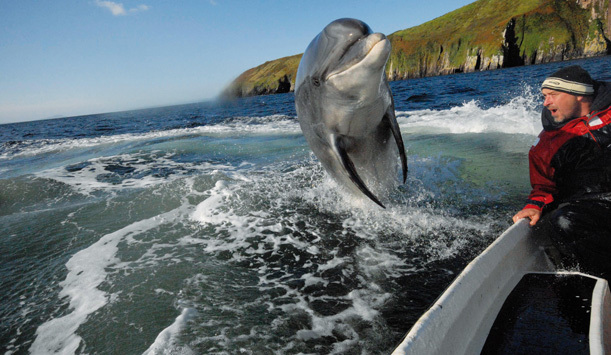 On the watery side of things, Fungie the Dolphin is still doing his thing in Dingle in County Kerry; while you can catch a ride from the North Irish Diver at Antrim's Ballylumford Harbour for some porpoise spotting. If it's the big-hitters you're after, Whale Watch Ireland in Cork invite people out every August to clap eyes on humpbacks and silver grey backs. 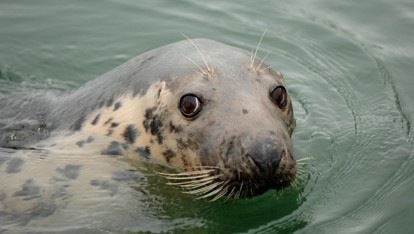 Oh, and along the coast, look out for seals, dolphins, basking sharks and even the odd killer whale, as spotted off Donegal's Inishowen in recent months. We also can't resist mentioning our three Global Geoparks: areas recognised by Unesco for their exceptional geological heritage, and another reason why our wildlife inhabitants are a pretty happy crew. The Geoparks also tend to be gob-smackingly beautiful: The Marble Arch Caves Geopark spans from Counties Fermanagh to Cavan and includes cliffs, forests, labyrinthine caves and mountains; while County Waterford is home to the Copper Coast Geopark, a veritable outdoor geology museum reflecting environments that have developed over a whopping 460 million years. Moving on to our third geopark: The Burren and Cliffs of Moher Geopark is a blockbuster. Famous for its striking limestone landscape, living wild in the crevices of this strange looking lunar landscape you'll find rabbits, wild goats, mink and badgers, and Ireland's only native lizard, the viviparous lizard, which can be seen scampering between shadow and sunshine at will. Up in the air, meanwhile, the Burren also takes great care of the rare Great Yellow Bumblebee. A Nature Reserve is an area that is protected under Ministerial Order in the Republic of Ireland. The National Parks and Wildlife Service lists them all by county. Those in Northern Ireland can be found on the NIEA website. Told you it was buzzing over here. Are you coming for a walk on the wild side?